This book is about language and the city. 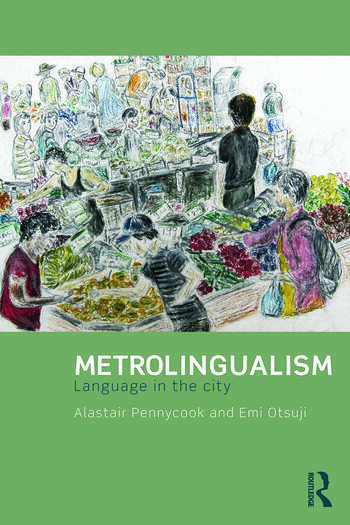 Pennycook and Otsuji introduce the notion of ‘metrolingualism’, showing how language and the city are deeply involved in a perpetual exchange between people, history, migration, architecture, urban landscapes and linguistic resources. Cities and languages are in constant change, as new speakers with new repertoires come into contact as a result of globalization and the increased mobility of people and languages. Metrolingualism sheds light on the ordinariness of linguistic diversity as people go about their daily lives, getting things done, eating and drinking, buying and selling, talking and joking, drawing on whatever linguistic resources are available. Engaging with current debates about multilingualism, and developing a new way of thinking about language, the authors explore language within a number of contemporary urban situations, including cafés, restaurants, shops, streets, construction sites and other places of work, in two diverse cities, Sydney and Tokyo. This is an invaluable look at how people of different backgrounds get by linguistically. Metrolingualism: Language in the city will be of special interest to advanced undergraduate/postgraduate students and researchers of sociolinguistics and applied linguistics. Spatial repertoires: "Pizza mo two minutes coming"
"Ma fi fruit bi nom? (There’s no fruit at all?)" Alastair Pennycook is Professor of Language in Education at the University of Technology Sydney. He is the author of many titles, including Language as a Local Practice (2010) and Global Englishes and Transcultural Flows (2007). Emi Otsuji is a Senior Lecturer at the University of Technology Sydney. She is the co-editor of the book Languages and Identities in a Transitional Japan: From Internationalization to Globalization (2015) and the Japanese editor for The Japan Journal of Multilingualism and Multicultuarlism.